I have no idea why this is called Hawaiian Haystack, but that’s what everyone I know calls it. I had never had this meal in Hawaii before. This is not a common meal in Hawaii. I was first introduced to this meal in Utah. For those who has never had this meal before, it starts with a base of rice and chicken gravy. Then you add your toppings. A list of suggested toppings are below. 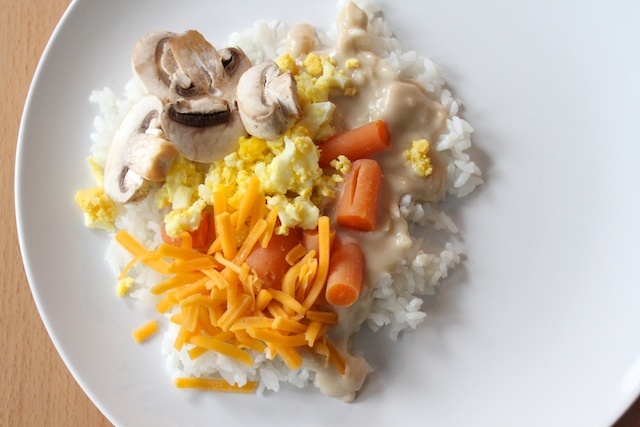 It may sound interesting to mix various toppings onto rice and chicken gravy, but it’s actually quite delicious. I was sketchy the first time I had this meal and now it’s a family favorite. The other night, I had everything ready to make Hawaiian Haystacks. Then while looking in the pantry, I realized I didn’t have any cream of mushroom or cream of chicken soup. I usually make a quick and easy chicken gravy from that. So instead, I came up with this recipe and it worked out quite well. 1. In a pot, melt the butter on medium heat. Add the chicken, celery and flour. Mix until the flour is clumpy and well mixed with the chicken. 2. Slowly add the milk and broth into the mixture. Stir continuously as you add the liquids to get out the clumps of flour. 3. Once the gravy is smooth, add the package of dried onion soup mix and stir well. Allow it to cook over medium-low heat until the gravy is back to a boil and thickens. 4. Serve over rice and add toppings. » Tell me… Have you had Hawaiian Haystacks before? What toppings do you like on it? I mentioned these last Friday. Too funny. I like celery and tomatoes with lots of cheese on mine. In my family, we call this Polynesian Pile-On or Chicken Haystack, depending on which in-laws you ask. My fav is green onions, soy sauce, cheddar cheese, pinapple, and Chinese noodles. Hi! I found you while searching for ice cream birthday party ideas for my sons’ first birthday next month. I’ve never seen ANYONE mention this recipe before & I had to comment! At my church growing up we always had this at a potluck, we simply called it “Polynesian potluck.” 🙂 Still one of my fave combos of flavors. I hate this crap and the person who invented ought to be shot. Its awful and people think that its okay to serve at what they want to call Hawaiian Luau. Its called Hawaiian Haystacks because it is typically topped with pineapple chunks and shredded coconut. It is not intended to be a Hawaiian dish in any way. Its a crowd pleaser and fun to top with lots of goodies. I like your take on it, too! We love Hawaiian Haystacks. With our family of 8 it has always been a crowd pleaser. We like to have peas, bamboo shoots, water chestnuts, rice noodles, slivered almonds, and shredded cheese on ours. We always top it with Soy Sauce. In our church once a month we have a Mix & Mingle afterwards. Each month it is a different theme. This month was Hawaiian Haystacks so I was looking for some different ideas to add with my sauce. Thanks for the ideas.